As if playing drums in a nationally touring band and making a living as a freelance graphic designer isn't enough talent for one person, the one-man musical force of nature that is Logan Whitehurst pulls off a career hat trick with his solo project of eight years, the Junior Science Club. He's a bit of an mp3.com superstar, having recently hit over 100,000 downloads with nary a sliver of marketing, save having his "Monkeys Are Bad People" played on the Dr. Demento show. And it's all done through the army of Logan, a plastic lawn snowman as a sidekick, and a Yamaha MT4X four-track. 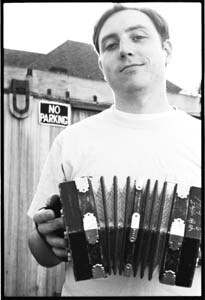 After attending Sonoma State University and playing for a few years in geek-rock band Litte Tin Frog, Logan settled in Sonoma County, recording more music in his bedroom than there are songs in an army of jukeboxes. While Logan in the real world is as personable and down to earth as can be, the Junior Science Club world is full of hot coffee, science textbooks that rhyme, and old monster movies. Here's a crib sheet for Logan's shiny new album, Goodbye, My 4-Track, whose 19 songs feature 17 guest musicians: songs mentioning brains, either removable or removed: two; songs mentioning heads falling off: one; songs name-checking Pee-Wee's Big Adventure: one. Released on Petaluma's Pandacide Records, it's Logan's first album for an actual label. Most of the recording for Goodbye, My 4-Track was done at Logan's house, though he did tote his four-track along to the homes of some of the musician friends he'd met while touring with the band he plays drums in, Sonoma County's art-pop stars the Velvet Teen. The songs are a mix of rerecorded versions of old favorites and a host of brand-new songs, ranging from "Me and the Snowman," which could just as well be from a Broadway musical, to the '80s-style rap "The Robot Cat," a song that rivals anything from DJ Jazzy Jeff and the Fresh Prince's He's The DJ, I'm The Rapper. For a guy who, until now, has self-released all of his music, Logan's output has been fairly prodigious--a few cassettes, mini-albums, and two full-length albums. His first album, from way back in 1997, was never even intended to be released. Logan just made copies for his friends, but the word got out, and their friends were soon asking for copies. "I didn't know how to use a four-track, and I didn't know how to play any instruments," Logan says. "I couldn't work out my ideas very well, and I just wanted to play with sounds. I'd sit down and try to harmonize with myself or start a drum machine . . . and that lack of skill translated to great appeal. It sounded like I was either trying really hard to make it sound bad, or I was just having fun. People really responded to it. I still have people who remember my very first tape--which I really can't listen to, by the way--but everyone loved, it because I was just goofing around." "My first two albums I put out on tape," he says. "The next ones were right when mp3.com started, and I thought, 'That's a great program, because I can just put my songs online and have people make CDs of them.'" Thanks to mp3.com, Logan has pockets of fans from Michigan to Seattle to Florida. The most shorthand, direct way to describe Logan's music is to drag out the very handy They Might Be Giants comparison: silly subjects and scientific songs whose didactic slant takes a back seat to catchy melody. "I guess people would see a lot of parallels," Logan says. "If what I have in common with They Might Be Giants is that my songs don't sound similar to one another and my subjects range from love and loss to someone's head falling off, then that's fine. They're the best example of what I aspire to be." A Junior Science Club show is straight-up fun, an event where even the hippest of hipsters can delight in singing along with gusto in an atmosphere that's saturated with enthusiasm and openness. Logan just gets up there with his keyboard and does his thing, like a hurdy-gurdy man gone digital. Volunteers from the audience go onstage to gurgle the fish's lines in "Lizard and Fish," and the crowd quickly picks up on the shout-along chorus to "Happy Noodle vs. Sad Noodle." "That's something that I got from my other bands," he says, "the ability to not be afraid onstage. I'm not a great live keyboardist, and I'm not a great rapper. But what I think the shows have is energy. I'm not afraid to make mistakes, and if I do, it's funny--it should be funny to the audience if I'm having a good time, no matter how crappy I am playing. "The audience responds a lot to that sense that it's a very personal show, for them or for me," Logan continues. "I try and make it as intimate as I can. When you tell an audience to participate, a lot of them feel put on the spot, like everyone's going to be listening to them and they probably shouldn't say anything. I'll write songs that make it really easy for you to get the clue that I want you to do this, and that's about as far as I'll go. If people want to dance, they can dance, and if they don't, I don't care." Logan's inanimate sidekick, Vanilla the Plastic Lawn Snowman, has been a part of every Junior Science Club show from the get-go, when Logan opened for Frank Black and the Catholics at the Phoenix. Logan had just received Vanilla as a birthday gift, and it gave him an idea. "Instead of going up with just a keyboard and a CD player, I thought, 'I'll just have this glowing lawn snowman onstage with me.' I introduced him as my sidekick because I thought it would be funny, and he got a giant round of applause." So call the Junior Science Club wacky and fun and witty--but don't think of it as comedy. Logan is not Weird Al. "The second anyone sees the word comedy, they think, 'Oh, it's parodies, it's satire, it's songs about sporks and pirates and ninjas,'" Logan says. "I don't want this to be classified as comedy--more like Jonathan Richman. The music is intelligent, the lyrics are intelligent. It's more fun for me to write something that makes me laugh. "My hope is to get to where I can write songs that are goofy and still have people appreciate them for the music, because I really do spend a lot of time on the music and try to do something interesting with everything." Logan grew up singing and messing around with taping skits and character voices on a cassette recorder, but he didn't really start playing music until he was 17 and his stepbrother started a garage band. "I went out in the garage, and I'd kind of bang on stuff to keep time for them. My stepmother heard this and went and paid $75 and bought a drum kit. It's the same one I have now, but it's done great--it's on all my recordings." Creative blood runs in the Whitehurst family. Logan's sister sings in the punk-Zeitgeist band known as Tsunami Bomb, who are currently headlining the Warped tour. "My sister and I started with the same sort of base in music," Logan says, "and then I got into movie soundtracks and '80s new wave pop, and my sister got into punk. Now she's at least met or been talked to by all of these bands that she had posters of up on her wall. I'm really impressed with what she's doing. They're like a rocket. I've got nothing but respect for that band." With his own project, Logan's highest aspiration is to get other people out there tinkering away on their own four-tracks. "I like compliments like 'You rock!' or 'That was a great show,' but every once in a while I get somebody saying they heard some music that I did, and it made them want to play music. That's the best thing. I don't care if they liked my music or they didn't like it, but I'd love to inspire somebody to do something like this--because I'm not a practiced and skilled artisan, I'm not lovingly crafting these songs. I just like music. I just wanted to do it." And then some. Hello, four-track. Logan Whitehurst and the Junior Science Club's CD release show is on Saturday, July 25, at 8pm at the Phoenix Theatre, 201 E. Washington St., Petaluma. The Librarians and the Huxtables headline, with Logan Whitehurst, Minus Vince, and Inanimate Objects opening. $8. 707.762.3565. Learn more about Vanilla at www.loganwhitehurst.com. From the July 24-30, 2003 issue of the North Bay Bohemian.